We think spa crafts are DA BOMB! 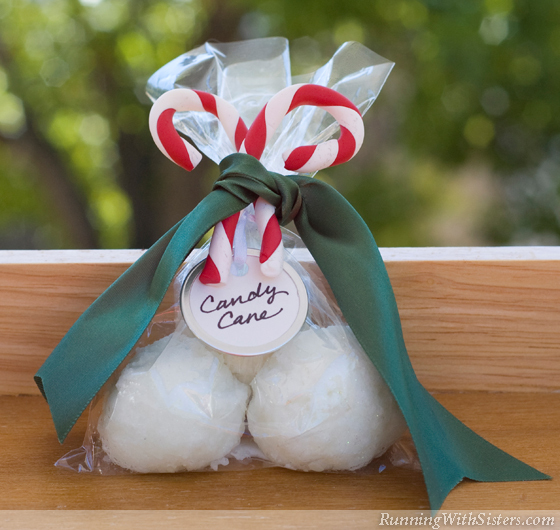 So for day three of our Week of Gift Crafts, we’re making bath bombs scented like candy canes. These treats make great Christmas gifts with bonus candy cane ornaments for the tree! This spa treatment recipe makes ten refreshing bath fizzies. Package nine as gifts for your friends and save one for yourself. You’ve got to test it, right? Citric acid (also called “Sour Salt”), 4 Tbsp. Iridescent soap glitter, 2 tsp. Studio By Sculpey Oven-Bake Clay, Poppy #6210 2.8 oz. 2. Using the melon baller, scoop out a ball of the mixture into your hands and press tightly together to form a ball. Place it onto a cookie sheet covered in waxed paper. Repeat until all of the mixture has been formed into balls. If your bath fizzies are crumbly and won’t stick together, add a few more drops of oil. If they seem too gooey, add more cornstarch. 3. Spritz each bath fizzy with one or two sprays of witch hazel. They will fizz at first, but will eventually dry to a crust. Allow the fizzies to air dry for a few hours, then turn them over and spritz the other side. Allow them to dry for 48 hours. 4. To create the candy canes, slice off 1/8 of the white Sculpey block using the clay cutter and roll into a 9″ snake. Repeat with the red clay. (Wash your hands in between or else the red will transfer onto the white clay.) Cut each snake into two 4 1/2″ segments. Twist one red and one white segment together tightly and roll into a smooth snake with a 1/4″ diameter. Cut a 4″ piece of the red-and-white snake and form into a candy cane. Repeat until you have 6 candy canes. Then bake at 275°F for 30 minutes. Let cool. 5. To package your bath fizzies, place three balls into a cellophane favor bag. Create the labels by writing “Candy Cane” on the round tags with a black Sharpie. Tie each bag closed with the white ribbon, slip a tag onto one of the ends, and tie a little knot. Tie the green ribbon around the top of the bag and tuck two crisscrossed candy canes into the knot. the grocery store in the spice aisle. skip the polymer clay and tie real candy canes on the package!